In what is perhaps the inevitable next step for the marketing juggernaut that is Angry Birds, Rovio has teamed up with George Lucas for the next installment in the Birds-Kill-Pigs franchise. 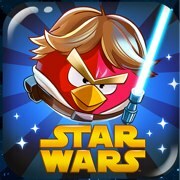 Angry Birds Star Wars, the company announced today, will be released on November 8th for iOS and Mac, as well as a host of other platforms. Rovio is going all out with the marketing tie-in, launching a Tumblr page with fan art, wallpapers, and more. "This is the best Angry Birds game we’ve ever done. It’s the best parts of Angry Birds with all new cutting-edge gameplay set in in a galaxy far, far away," said Peter Vesterbacka, the Mighty Eagle and CMO of Rovio. "As a big Star Wars fan myself, I’m really excited about this new universe. The Force is definitely strong with this one." milk it baby, milk it! Two over-milked franchises for the price of one! Not cutting edge, New York hipsters like you. George Lucas would have never allowed this!...Oh wait he did! Excellent timing! I could probably use some cheering up after the elections. But the big question is: who's gonna shoot first, the birds or the pigs?! Angry Birds : Happy Days! In which the main goal is to ensure the bird's trajectory lands them safely on the other side of the shark.